Vincent Chew sold his HDB flat to build his first boat. His second boat got impounded and he got cheated of $800,000 by a New Zealand boat builder. Despite the setbacks, his company White Manta Diving is now one of the top dive operators in Asia. Two decades ago, when he was a struggling scuba dive instructor, Mr Vincent Chew used to dream of owning his own swimming pool. "I thought it would be so nice if I didn't have to conduct lessons and jostle with other instructors in public pools," he says. His dream is about to come true. Mr Chew, 52, is now working with architects to build a new home in Thomson, one which comes with an indoor 12m by 5m swimming pool in the basement. When completed in 2019, the pool will be used not just for scuba diving training. His wife and three of his four daughters are qualified baby swimming instructors, so they will be using it to conduct swimming lessons for infants and toddlers, too. Having his own private pool is the latest feather in the cap for Mr Chew, who left school with just one O-level pass in 1981 but now owns two diving boats and is one of Asia's top diving operators. Lithe with his skin burnished brown by the sun, he admits to being surprised at how far he has come. "But I've also worked very hard, and taken some big risks," he says with a grin. Life did not start on a rosy note for Mr Chew, who grew up in a one-room rental flat in Toa Payoh Lorong 5. "My father was a sailor. We saw him only once a year, and he really didn't contribute much to the family. He died of cancer when I was 13," says the fourth of five children. His mother toggled two jobs - as a vegetable seller by day and a hawker assistant at night - to raise her five children. Left to his own devices, he made friends with peers more interested in mischief than in books. Sheepishly, the former student of Pei Chun Primary and First Toa Payoh Secondary said he often got into all manner of trouble, from stealing and fighting to gambling. When he was 12, he was caught shoplifting at the now-defunct department store Emporium in Toa Payoh and let off with a stern warning from the security guards. "I also broke into the principal's office to look for exam papers on a Sunday when I was 14. I didn't find any. And I didn't get caught," says Mr Chew, who was always among the bottom three students in class. His O-level results were disastrous; the only subject he passed was Chinese. "I didn't bother resitting the exams. I knew that studies were not my future." Instead, he set his sights on becoming a commercial diver. "I had heard that you could earn more than $10,000 a month, and you didn't need a degree," he says. The only snag? He had no money to get a diving licence. So he did the next best thing and signed up with the Singapore Naval Diving Unit when he was 17. "At that point in time, you just needed a Secondary 2 education. I thought I could get trained and then become a commercial diver after the end of my bond," he says. Life in the navy suited the athletic youth and he did well in all his courses. Three years later, he set his sights on the Special Operations Force because the pay was higher. The unit, created by the Singapore Armed Forces, comprises elite soldiers trained to deal with terrorist threats and other dangers. "There was also a danger allowance," says Mr Chew, who made the cut and had to undergo intense training, from jungle survival to terrorist warfare. After five years as a commando in the diving platoon, he struck out on his own. Not to become a commercial diver as he had planned to, but to start a diving business. A week-long leisure adventure trip to Tioman Island a couple of years earlier prompted the change of heart. "It opened up my eyes to (recreational) diving and made me realise how fun it was," says Mr Chew, who took his sport diving instructor course in his final year in the navy. Together with a friend, he plonked in $5,000 to rent a small office in Geylang, buy second-hand equipment and start a leisure diving business called Fisherman Diving Services. Differences made them part ways after just six months. Another partnership not long after also did not work out well. In 1993, when he was 29, he decided to go solo and set up Vincent Dive Centre. By then, he was married to Ms Sharon Koh, a former executive at a mail order firm. The early years were exhausting, he says. He pulled long hours on weekdays, and spent almost all weekends on diving trips to Malaysia. "I was not around on all public holidays and didn't get to spend a lot of time with the kids then," says Mr Chew, whose four daughters, including a pair of twins, are aged between nine and 24. His break came in 1998 when he boldly sold his four-room HDB flat in Bishan and used the proceeds to buy a diving boat, which he called MV Vincent. "I bought it for $100,000, and spent another $200,000 to renovate it," he says. "Frankly, I never thought about what would happen to me if I didn't make it. We'd have been without a roof over our heads," says Mr Chew, who moved into a rented house for a few years before buying an HDB maisonette on the resale market. "My income went up. With your own fishing boat, you had to organise trips, and, every week, we were fully booked," he says. Things hummed along nicely. With the help of some investors, he built a bigger and better boat, which he named White Manta, in Thailand, and also registered his business there so that he could organise diving trips in the country. "I was organising trips to only Malaysia before that," he explains. But in October 2004, a crisis almost killed his business. He had led a diving expedition near Anambas - part of a group of islands in the Riau Islands province in Indonesia - when the group of 32 was detained by the Indonesian navy for entering its waters illegally. Mr Chew says his charts showed that they were diving in international waters but the Indonesian officers showed him charts which indicated otherwise. The Indonesian authorities later said the boat was detained because of "increased sensitive issues" linked to piracy and terrorism. The group was detained in Tanjung Pinang for four days. "We were allowed to stay on the boat and were treated well," he says. However, the White Manta was impounded for another four months. Many people approached him saying they could help. He spent more than $50,000 trying to get his boat released but to no avail. "There was a lot of hope, and a lot of disappointment," he says. There were a heap of other woes. He had forked out a deposit to build a third boat, Black Manta, and had to give a refund to clients who had booked trips. To make matters worse, he could not organise any trips because he had, by then, sold his MV Vincent. "I thought I was finished," he says. To cope, he had to borrow money from friends and cut expenses, such as tuition for his daughters. Fortunately, a client led him to a lawyer who got him out of his pickle; he got his boat back in February 2005. The episode, however, might have been a blessing in disguise, he says. "Friends told me I was lucky, that my boat could have been out in Thailand and hit by the tsunami," he says, referring to the tsunami which killed more than 250,000 people in 14 countries on Boxing Day, Dec 26, in 2004. "They were right. My boat would definitely have been out." Mr Chew beavered away to put his life back on track. A lucky break came later that year when an Indonesian marine fisheries official approached him for help in exploring the Anambas Islands. "They knew I was familiar with the area and wanted to recce the place to find out if they could turn Anambas into a second Maldives. I agreed to sponsor the team for a week," he says. 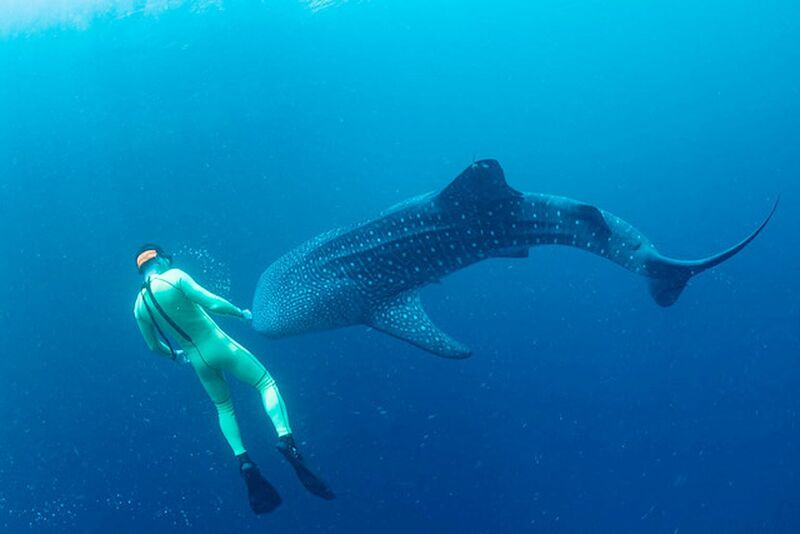 The friendships and ties he made stood him in good stead when he decided to branch into Indonesia and apply for access to good diving sites. He has not looked back since. His business grew steadily. Over the years, he sold his old boats and bought new ones. His company, White Manta Diving, now owns two boats: The Raja Manta, an impressive 36m-long steel range diving support vessel, and The KM Blue Manta. Costing $3 million, the Blue Manta measures 45m by 9m, and is possibly the largest purpose-built dive vessel in the region. Both boats come with cabins and can accommodate at least 20 divers. Mr Chew declines to reveal his annual revenue but says that he employs 47 people of different nationalities, including French and British, and has the biggest workforce in the diving industry in Singapore. "I'm doing okay. I managed to pay off this house in seven years," he says, gesturing to the garden in his corner terrace house in Thomson. The house, which has a built-up area of 3,300 sq ft, cost him $2.3 million in 2008. His new house, the one with the indoor swimming pool, is bigger and sits on 4,000 sq ft of land. He bought it at an auction but declines to reveal how much it cost him. "I've been in the business for 27 years. The first 10 years, I invested a lot of time to get a good base of clients. The next 10 years, I invested in training and educating divers. "I spent the last seven years on overseas marketing. I take part in trade shows every year in countries like Japan and Australia," says Mr Chew, whose company organises at least three trips, each lasting between seven and 12 days, each month. He reckons he is blessed but feels that his big appetite for risks has helped him get to where he is. "I developed it in the army, I guess. In the special forces, you are trained to take risks and make decisions, although not every decision would be advantageous," he says. It helps, he says, that his wife Sharon, 49, is a sturdy pillar. "She really looked after the family when I was out diving so that I could focus on the business," says Mr Chew. Flashing a huge grin, he describes himself as a lucky man. "I love the water. I need to swim every day. I've found the best job because it's also my hobby. "I enjoy what I do, I see the fruits of my labour and I'm happy."